Radial keratotomy is a surgery performed on the covering of the eyeball (the cornea). It is used to permanently correct near-sightedness, or myopia. In myopia, light rays entering the eye's lens are bent too much. The rays focus in front of, instead of onto, the back of the eye, or the retina. 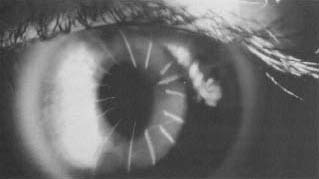 In radial keratotomy, incisions made on the cornea to refocus the light rays. The first radial keratotomy was performed in Japan in 1955. Like most new techniques, it was considered a risky procedure. Procedures were improved in the 1990s and many patients have successfully undergone the surgery. Radial keratotomy. The procedure is used to permanently correct near-sightedness, or myopia. Interviews with hundreds of patients show that after surgery, two-thirds of them were able to stop wearing eyeglasses or contact lenses. Some patients however, still needed lenses because they did not get the proper amount of correction. If there is not enough correction, the patient continues to have myopia. Too much correction however, causes farsightedness. Further refinements are being made in the procedure to eliminate these undesirable results. Corneal sculpting, also known as laser surgery, corrects myopia in about 30 seconds. While the procedure is being performed in other countries, it is not approved for use in the United States.